* When you become pregnant, and your pregnancy is confirmed by a doctor, report it to the Public Health and Welfare Center Childrearing Support Office of your Ward Office or Branch Office, and receive a Mother and Child Health Handbook. * During pregnancy, you can get maternity health checks (Ninpu Kenshin) at a clinic or a hospital that has an obstetrics department. * With your Mother and Child Health Handbook, you will receive Jyushin-ken Checkup coupons for maternity health check-ups that will help with the cost of health check fees. * The Public Health and Welfare Center Childrearing Support Office at your Ward Office or Ward Branch Office issues the Mother and Child Health Handbook. You will have a consultation with a public health nurse on health issues when you receive this handbook. For those who are pregnant for the first time, a public health nurse or other personnel will visit your house to give you advice and answer your questions. This handbook plays an important role in protecting the health of mothers and children. 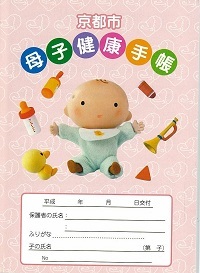 If you are pregnant, you can receive the Mother and Child Health Handbook at the Public Health and Welfare Center Childrearing Support Office of your Ward Office. English, Chinese and Korean versions of the handbook are also available. You can keep a record of your own health as well as your baby’s health in this handbook. You can also keep the record of vaccinations in this handbook. Please be sure to take it with you whenever you visit a hospital or the Public Health and Welfare Center Childrearing Support Office. Expectant mothers in Japan usually give birth either at a hospital or a maternity clinic. After the delivery, a public health nurse or other personnel from the Public Health and Welfare Center Childrearing Support Office will visit the mother’s home and advise her about childrearing. What to do after your baby is born? ② Report the child’s birth by taking the birth certificate to the ward office and filing the Birth Registration form within 14 days after the birth. ※ If one or both parents are foreign nationals, it is necessary to also report the birth of their child to their embassy or consul general. ③ Special Permanent Residents must obtain the status of Special Permanent Resident for their child at the Ward Office. ④ In case of medium and long term residents, bring the child’s Birth Registration Certificate or Resident Certificate to the immigration office to get the status of residence for your child. * Obtain a passport for your baby at your embassy or the consulate. Enroll your baby in your health insurance system as a dependent. * Take your child for regular medical check-ups. * Public Health and Welfare Center Childrearing Support Office at your Ward Office or Ward Branch Office offer health checks and vaccinations to infants for free. A person enrolled in medical insurance will receive a lump-sum allowance for childbirth after giving birth to a child. Pregnant mothers become eligible after 84 days, even if the mother later has a miscarriage or stillbirth. For the National Health Insurance System, those who are eligible for the Maternity Medical Compensation Policy will receive 420,000 yen for delivery. Those who are not eligible for this program will receive 404,000 yen. For parents of infants and young children with health check appointments, who are foreign nationals and do not feel able to converse with public health nurses in Japanese, this administrative interpreting service is available. Please consult the Public Health & Welfare Center Childrearing Support Office at your ward or branch ward office for more information. We compiled useful information for mothers and fathers who are giving birth and raising children in Kyoto. With this program, you will pay only 200 yen per month per medical institution for children ages 0 to 3rd year of middle school, who received medical care while hospitalized. For outpatient treatment for children younger than two years, you will pay only 200 yen per month per medical institution. For children between the ages of three and 3rd year of middle school, you will pay only up to 3,000 yen per month per medical institution. If the total medical fees exceed 3,000 yen in a month, you can submit an application and once accepted the program will reimburse the amount exceeding 3,000 yen. A parent or parents raising children under Junior High Year 3 (16 years old) can qualify for monetary support (Child Allowance). ※ For further information, visit Child and Family Support Section TEL：075-251-1123 or Public Health and Welfare Center Childrearing Support Office at your Ward Office and Ward Branch Office. * You will receive priority in the public housing program. There are also some other forms of assistance for single parents. Child daycare centers accept children younger than elementary school age. The fee is determined by family income. This service is available for parents who cannot take care of their children, because of work, study or illness. Submit documents proving your eligibility, such as working certificate, student ID, etc., and if you were not a resident of Kyoto City as of January 1, 2017, you must show a tax payment certificate. Please bring these documents to the Public Health and Welfare Center at your Ward Office or Ward Branch Office. Children up to 18 years old together with their parents or guardians can use these facilities to play games and sports for free. This program aims at the safety and healthy growth of those children in the lower grades of elementary school whose parents are not at home during the daytime. This program is conducted at Jido-kan and Gakudo child-care centers. Children can participate in this program after school. In order to use this program, one must apply in advance. For parents raising children in Kyoto, foreign residents and Japanese citizens alike, it is okay to bring your child with you. Education Support for Children: Japanese language support for studies at school and homework. Playtime is available to make this program an enjoyable experience for children. Is a free facility with a large-size playground equipment in the Kodomo Genki Land area (for children who have not entered elementary school accompanied by a parent or guardian) and a children’s library full of pictures to enjoy at the Kosodate Tosho-kan. This is a free facility that anyone can use. There are picture books and children’s literature related materials, there are also books written in English. There are readings and craft activities held and children may play with the facility’s toys. In Japan, the education system is comprised of six years of elementary school, three years of junior high school, three years of senior high school, and 4 years of University (2 years of junior college). Elementary through junior-high school education is compulsory. In principle to enter senior high school and university, one must pass an entrance examination. In addition, there are some vocational schools which target junior and senior high school graduates. There are national schools managed by the state; public schools managed by prefectures, cities, wards, towns and villages; and private schools managed by school foundations. The school year starts in April and ends in March the following year. Children between the ages of three to six are eligible for kindergartens. The City of Kyoto operates 15 kindergartens which accept children between the age four and five from April 1 (some kindergartens also accept 3 year-olds). The area in which you live determines which Kindergartens are possible to enroll your child in. ★ The following website provides information on private kindergartens located in Kyoto. see here. If you want to go to elementary and junior high schools in Japan, you can go to elementary school children and junior high school students of any age by going through the procedure. ◆ Procedures for enrolling foreign children into Japanese elementary and junior high schools. ① When you register your address with your Ward Office or Ward Branch Office, mention that you would like to enroll your child in a Japanese Elementary or Junior High School and receive a Transfer Notice or Entering School Guide (document) (Tennyugaku Tsuchisho or Shugaku no Goannai). ② Get information about the different elementary or junior high schools your children could attend. ③ Visit a school and submit the School Entrance and Transfer Notice or Entering School Guide (Shugaku no Goannai). The school will give you the Enrolment Form for Foreign Children (Gaikokujin shugakutodoke). Please complete all necessary procedures, including filling out the enrollment form and returning it to the school. ◆ Text books for elementary school and junior high school are free. School lunch, which is served at elementary schools, costs 4,700 yen per month. Junior high school pupils can choose between school lunches and homemade lunches every month. One school lunch costs ¥310 yen. ※ A Financial support program is available for those families with financial difficulties. Ask a teacher at your child’s school about how to apply for the School Aid System (Shuugaku enjyo). Children, who cannot speak Japanese, are able to receive Japanese lessons at the school. In addition, we can dispatch an interpreter etc. Senior high school education is not compulsory in Japan. There are public schools (national, prefectural and municipal schools) and various types of private senior high schools. The academic level of the children who want to enter Japanese senior high schools must be equivalent to a Japanese junior high school education. ※ For families of students or students who would like to attend high school but have financial difficulties, there is a High School Entrance Support System where financial support is available (for high school or vocational schools). * Child and Family Support Sub-Office TEL：075-251-1123 or your ward or branch ward office’s Childrearing Support Office (Public Health and Welfare Center. There are some international schools where the classes are taught in English, French or Korean. Such schools are classified as schools of “miscellaneous category” by the School Education Law. Some Japanese universities refuse to allow the graduates of these schools to take their entrance examinations. However, depending on the school, graduates may qualify to take Japanese university entrance exams. For details, inquire at the school.